Mr. Galloway received his undergraduate from the University of Alabama, where he was named an Alumni Honors Scholar. 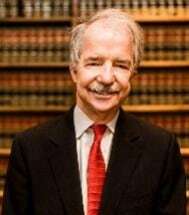 Since graduating from the University of Mississippi Law School in 1975, Mr. Galloway has tried numerous jury trials, and has been counsel of record in appeals before the Mississippi Supreme Court, the Court of Appeals for the Fifth Circuit, and the United States Supreme Court. In addition to an active jury trial practice, Mr. Galloway has been lead counsel in non-jury and administrative proceedings. He has served on the Board of Governors of the Mississippi Association for Justice and has been involved in various activities of the Mississippi State Bar. He is presently an active member of the American Association for Justice. He has been selected by his peers to be included in The Best Lawyers in America in the specialties of Medical Malpractice Law and Personal Injury Litigation. While being involved in a variety of legal matters, Mr. Galloway's primary areas of interest are Personal Injury, Criminal Defense, and Contract Law.